2011 Pumpkin Patch Shop Hop! PASSPORTS CAN NOW BE PURCHASED AT ANY PARTICIPATING STORE FOR $5. We’ll be posting teasers of the shop hop quilt soon! Scheduled specifically for the Beautiful Michigan Fall Colors, just another bonus for the ride! SHOP HOP INFORMATION – More details on passport. Check with your local stores about bus rides, leave the fun to us! Passports will be $5.00. The passport will provide each participant entrance into 7 Quilt Stores for a 3 day extravaganza of rewards. Every store will provide each customer with a gift upon entrance. Every store will provide a 20% storewide sale on fabrics cut from the bolt. Every store will have additional specials, sales or goodies for passport holders only, inquire at each store for their rewards. Every store will provide a portion of the original design 2011 progressive quilt. FREE acrylic charm templates will be given to every passport holder by each store while they last. This year’s quilt will be a simplistic and serene landscape. It shows a wonderful and rich night sky blue background with three different yellow stars and a moon. It also has three different pine tree designs in shades of greens that scatter across the bottom. With the exception of the moon, it is pieced with straight line sewing, and can be increased in size with additional blocks and/or optional borders. Border kits, border fabrics, binding and backings can be purchased at any of the seven stores during the hop at the 20% discount. There are a total of eight kits (two will be available at Sew What in Wyandotte and one will be available at each of the other six stores). This year, because we are included detailed color picture pages of the pattern, it will only be available in the fabric kits for the quilt. When you see how easy the visuals make it to cut and sew the quilt, you will know it was worth it. The kits will only be $7 at each store, a great low price for a wonderful quilt with patterns. 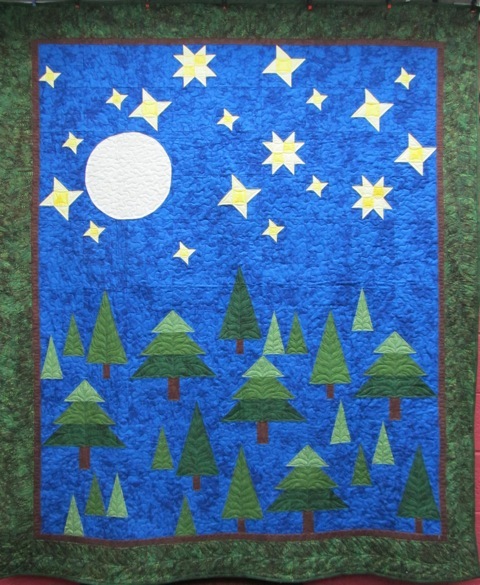 The cozy quilt can easily be customized for that perfect cabin quilt, for nature lovers, picnics, a manly man or just a concert in the park. The quilt and additional border ideas will be submitted for your viewing by the individual stores as they are finished. Total of 12 prizes will be given drawn from stamped and completed passports. These certificates may be used at any store for in-store merchandise only. Included in the passport will be raffle tickets to be deposited at each of the seven stores for additional store give-aways. Prizes will be determined by each store and drawn from store participant passport entries. Be sure to check back here or at the Pumpkin Patch Shop Hop site for all of the details to come. We will be posting information on the progressive quilt, shop hop hours and so on.